The third and fourth hitters in a lineup, respectively, are traditionally the most feared batters on a team. There are obviously quite a few exceptions. The Yankees bat Curtis Granderson second when everyone is healthy, and he has 36 home runs and leads the majors with 103 runs batted in this year. Ichiro Suzuki (who, despite a down year, is still the most feared hitter in Seattle’s lineup) and Jose Reyes almost always bat leadoff for the Mariners and Mets, respectively. But for a pitcher, there is nothing worse than seeing a dangerous No. 3 batter step into the box and looking over to the opposing dugout to see another dangerous weapon lurking in the on-deck circle. 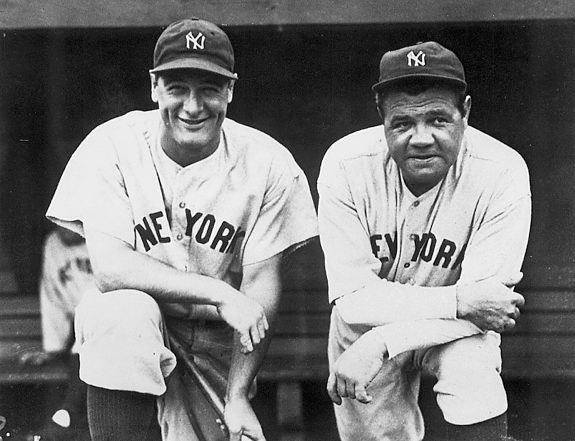 Perhaps there is no 3-4 punch in baseball history quite as feared as the Yankees’ Babe Ruth-Lou Gehrig duo was from 1926 through 1934 (Gehrig was the No. 5 batter on the 1925 Yankees). On the 1927 Murderers Row team, Ruth hit .356/.486/.772, Gehrig batted .373/.474/.765 and the pair combined to swat 107 home runs and drive in 339 runs. In 1930 Ruth had a .359/.493/.732 batting line, Gehrig hit .379/.473/.721 and the duo combined for 90 homers and 327 RBIs. The very next year, Ruth batted .373/.495/.700 at age 37, his final truly great season, and Gehrig hit .341/.446/.662. They smashed 46 homers apiece and drove in a combined 347 runs with Gehrig driving in 184 of them by himself, the most ever by an American League player in a season. In the nine seasons they batted third and fourth respectively, Ruth and Gehrig combined to drill 771 home runs with 2,748 RBIs. There has been no 3-4 combo that has been feared more or put up better numbers in all of baseball history. A more modern example of the production Ruth and Gehrig put up from the three and four holes in the lineup, respectively, comes from the 2004 through 2008 Boston Red Sox. David Ortiz and Manny Ramirez did not have the same longevity of Ruth and Gehrig, but there were equally as feared by major league pitchers. In 2004, their first season as a 3-4 combo and the year the Red Sox broke an 86-year drought to win the World Series for the first time since 1918, Ortiz hit .301/.380/.603, Ramirez batted .308/.397/.613 and the duo combined for 84 homers and 269 RBIs. The next year, Ortiz had a .300/.397/.604 batting line, Ramirez hit .292/.388/.594 and they combined to whack 92 home runs and drive in 292 runs. 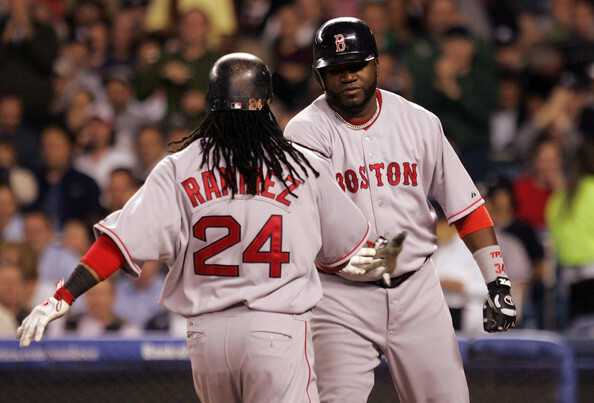 In their four and a half years as a 3-4 combo (Ramirez was traded to the Dodgers on July 31, 2008), the duo produced 354 homers and 1,120 RBIs and helped win Boston’s only two modern World Series championships. No 3-4 combo today comes close to the Ruth/Gehrig standard of excellence. Nonetheless, there are still some very good ones that are very tough to pitch to, despite injuries limiting many of baseball’s most dangerous 3-4 duos this year. Washington’s Ryan Zimmerman and Michael Morse don’t match up statistically (combined for 30 home runs and 106 RBIs) with the rest of baseball due to a Zimmerman injury that caused him to miss 58 games, but give the Nationals something to build around with their young and talented farm system. The Phillies have seen a similar problem with Chase Utley missing 51 games with an injury, and as a result, have seen their 3-4 duo combine of Utley and Ryan Howard combine for 36 home runs and 138 RBIs, well below what they normally produce together. The Yankees’ Alex Rodriguez has missed 46 games this year, but he and Mark Teixeira have still hit 49 homers and driven in 152 runs combined. Kevin Youkilis has missed 21 games for the Red Sox, but has combined with Adrian Gonzalez to blast 40 home runs and bring home 181 runs. The Rangers have lost Josh Hamilton for 40 games, but he and Michael Young have hit 27 homers and driven in 157 runs. Albert Pujols and Matt Holliday have missed a combined 42 games to injury, but have hit 50 home runs with 145 RBIs. Cincinnati’s Joey Votto and Jay Bruce have stayed healthy, each knocking in 84 runs and combining for 51 long bombs, but have been plagued by Bruce’s inconsistency all year long. However, healthy or not, none of these duos match the Milwaukee’s Brewers 3-4 punch of Ryan Braun and Prince Fielder. 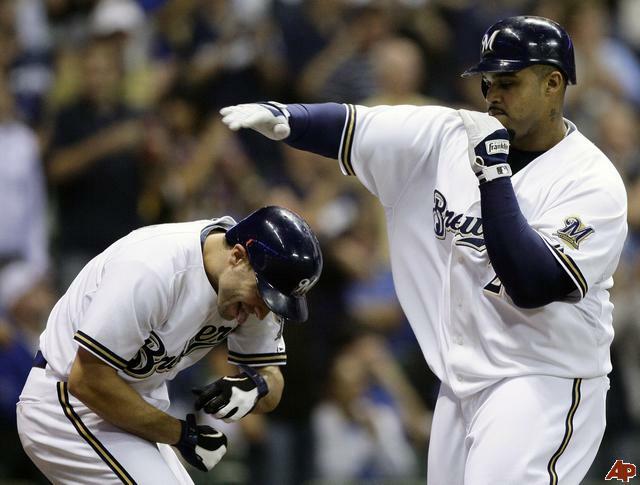 Braun and Fielder have terrorized opposing pitchers together since Braun reached the big leagues in 2007. Their first year together, Braun hit .324/.370/.634, Fielder batted .288/.395/.618 and the pair combined for 84 home runs and 216 RBIs. The 2009 season was another remarkable campaign for the anchors of Milwaukee’s order, combining for 78 homers and 255 RBIs while Braun owned a .320/.386/.551 batting line and Fielder hit .299/.412/.602. In what is likely their last year mashing together in the lineup because Fielder is a free agent at the end of the season, the duo have smashed 53 home runs and driven in 187 runs together, the most production of any 3-4 duo in baseball. Braun is posting career-highs in batting average (.333) and on-base percentage (.404), and is also leading the National League in slugging percentage (.592). Fielder meanwhile, leads the NL in RBIs with 101, is fifth in slugging percentage (.547), and is close to matching career-highs in average (.298) and OBP (.413). The pair also has the longevity factor, as they will have been placed as 3-4 batters, respectively, in the Brewers’ lineup for five seasons by the end of this year. They have combined to pound 343 home runs and drive in 1,052 runs in their time as a 3-4 punch. Their production together is the closest baseball has had in a 3-4 duo since Boston’s Ortiz/Ramirez combination, and they are dangerously close to the numbers that Ortiz and Ramirez put up together in the four and a half years they spent destroying opposing pitching in the middle of the Red Sox order. The one thing the Ortiz and Ramirez were able to do together that Braun and Fielder have not is consistently win. The Brewers hold a 9.5 game lead over the St. Louis Cardinals in the NL Central, and if they hold on, it would be the first time Milwaukee’s 3-4 punch has won a division and only the second time they visited the postseason. In comparison, the Ortiz/Ramirez 3-4 duo won one division but also two World Series titles together, going to the playoffs a total of three times. While it may end this offseason because Fielder is expected to sign elsewhere in free agency, the Ryan Braun and Prince Fielder 3-4 punch is the most feared in the majors today – and the best in baseball since David Ortiz and Manny Ramirez bludgeoned opposing pitching in Boston’s order from 2004 through the middle of the 2008 season. This entry was posted on August 27, 2011 by Scott Kornberg. It was filed under Babe Ruth, Boston Red Sox, David Ortiz, Lou Gehrig, Manny Ramirez, Milwaukee Brewers, New York Yankees, Prince Fielder, Ryan Braun and was tagged with A-Rod, adrian gonzalez, Alex Rodriguez, Babe Ruth, Big Papi, Boston Red Sox, brewers, Chase Utley, cincinnati reds, David Ortiz, Jay Bruce, joey votto, Josh Hamilton, Kevin Youkilis, Lou Gehrig, Manny Ramirez, Mark Teixeira, Michael Morse, Michael Young, milwaukee brewers, Murderers Row, nationals, New York Yankees, philadelphia phillies, phillies, Prince Fielder, Rangers, red sox, reds, Ryan Braun, Ryan Howard, Ryan Zimmerman, Scott Kornberg, texas rangers, Washington Nationals, yankees.